One of the girls from the hostel gave a speech to the leadership a few years ago when they visited the hostel. The girl said; “We the girls in the hostel at Bwiam, the Gambia, are thankful for the establishment of this hostel which has not only given us accommodation, but has also served as foundation for our faith. This hostel has a great impact on us. This hostel and the sisters who serve here have given us great benefits. What we are able to accomplish through our education will not only benefit us, but all of the Gambia. We have been asking God in our daily prayers to shower His unending blessings on all of you for your great contribution to our academic welfare. There is no way that we can repay you for your goodness to us, but we only hope to follow your lesson in generosity. This lesson we will always carry with us. We appreciate all your efforts, though we cannot adequately express ourselves in words. In our minds, our gratitude is like a constant meditation. Thank you for all your kindness”. The SSND Girl’s Hostel we opened in 1991 to help the Christian girls who live far from the school and would not be able to attend the school if they did not have accommodation. Majority of the girls who have lived in the hostel have performed very well and have continued with their further education in colleges and universities after finishing Senior Secondary School because of the favorable study environment offered in the hostel. We are very proud of them. 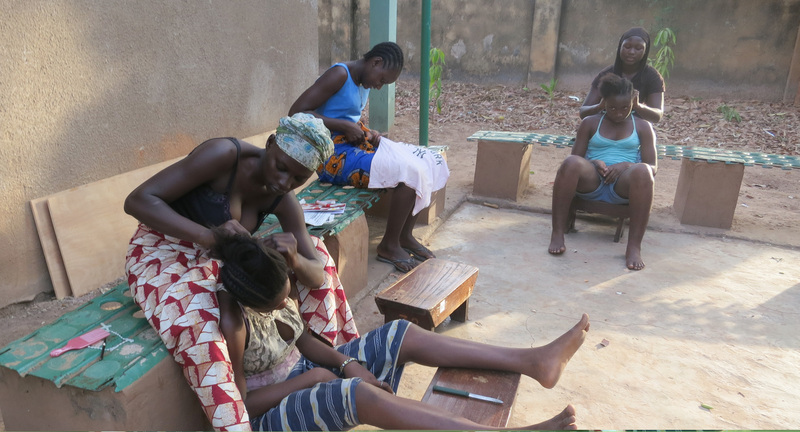 In this academic year, 19 girls are living in the hostel. They are from different tribes and at different levels of education. Though they have good facilities for study, many of them need help to understand the value of education. The girls besides studies are also responsible for the place where they live by keeping order and cleaning the place, bringing firewood from the bush, they cook during the weekends and grow vegetables to reduce the expenses of feeding them. The greatest challenge is that of having to remind them often of their duties. Currently, it is difficult to run the hostel due to the economic inflation which has led to most of the needed resources being quite expensive coupled with the fact that majority of the girls are from poor families, mostly farmers and it is not easy for them to afford to pay for their stay in the hostel. The hostel fees that they pay for their stay is so little that it does not cater for the rice they need to last them for the three months of the term. Therefore, most of the time, we rely on donations to provide them with enough food for the whole time that they are in the hostel. We trust in God’s providence and continue to pray for our benefactors who have supported us and helped us to keep the hostel running this far. The music in this video was created by our African novices. They got very creative as they learned more and more about the history and charism of the School Sisters of Notre Dame. We are very blessed.